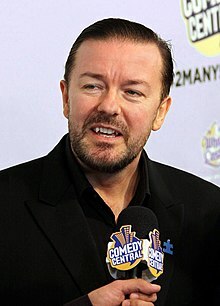 Ricky Dene Gervais (born 25 June 1961) is an English comedian, actor, director, producer, musician, writer, and former radio presenter. The truth doesn’t hurt. Whatever it is, it doesn’t hurt. It’s better to know the truth. If there is a god, why did he make me an atheist? That was his first mistake. Well, the talking snake was his first mistake. Why don’t you believe in God? I get that question all the time. I always try to give a sensitive, reasoned answer. This is usually awkward, time consuming and pointless. People who believe in God don’t need proof of his existence, and they certainly don’t want evidence to the contrary. They are happy with their belief. They even say things like “it’s true to me” and “it’s faith.” I still give my logical answer because I feel that not being honest would be patronizing and impolite. It is ironic therefore that “I don’t believe in God because there is absolutely no scientific evidence for his existence and from what I’ve heard the very definition is a logical impossibility in this known universe” comes across as both patronizing and impolite. Science seeks the truth. And it does not discriminate. For better or worse it finds things out. Science is humble. It knows what it knows and it knows what it doesn’t know. It bases its conclusions and beliefs on hard evidence -­- evidence that is constantly updated and upgraded. It doesn’t get offended when new facts come along. It embraces the body of knowledge. It doesn’t hold on to medieval practices because they are tradition. If it did, you wouldn’t get a shot of penicillin, you’d pop a leech down your trousers and pray. I think a comedian's job isn't just to make people laugh. I think it's to make people think. Animals are not here for us to do as we please with. We are not their superiors, we are their equals. We are their family. Be kind to them. It’s awful to think of people eating dogs, but some people eat pork. I don’t, but some people do. And a pig is just like a dog, there is no difference between them.